Western North Carolina (often abbreviated as WNC) is the region of North Carolina which includes the Appalachian Mountains, thus it is often known geographically as the state's Mountain Region. It contains the highest mountains in the Eastern United States. Western North Carolina is sometimes included with upstate South Carolina as the "Western Carolinas", which is also counted as a single media market. The region covers an area of about 11,000 square miles (28,000 km2), and is roughly the size of the state of Massachusetts. The population of the region, as measured by the 2010 U.S. Census, is 1,473,241, which is approximately 15% of North Carolina's total population. The Foothills is a region of transitional terrain between the Piedmont Plateau and the Appalachian Mountains, extending from the lower edge of the Blue Ridge escarpment into the upper Catawba, Yadkin, Broad, Saluda, and Savannah River valleys. The eastern slopes of the Blue Ridge drop sharply to the foothills section, going from 3500–4000 feet (1,000–1,200 m) at the top to only 1000–1500 feet at the base. The foothills region contains numerous lower peaks and isolated mountain ranges such as the South Mountains, Brushy Mountains, and Stone Mountain State Park. The foothills are divided into many small river and creek valleys that contain much of the region's population. Although no large cities are located in the foothills, the region does contain many small towns; the towns often developed around a single industry such as furniture or textiles. As these industries steadily moved to low-wage markets in Asia and Latin America since 1990, the foothills towns that depended upon them have often suffered from job and population loss; some of these towns are developing a new economy based on tourism and catering to affluent retirees who have settled in the region. Many farmers in the northern foothills are poultry farmers as well, and winemaking and vineyards are growing in popularity. Among the towns of the foothills region in North Carolina are Tryon, Columbus, Chimney Rock, Lake Lure, Forest City, Rutherfordton, Spindale, Mount Airy, Elkin, and Marion and the cities of North Wilkesboro, Wilkesboro, Hickory, Lenoir, Shelby, and Morganton. Along with other rural regions which have received national notoriety, changes brought by heavy tourism and population growth from re-locators present a double-edged sword. Local business benefit from increased economic revenue but increases in costs of living, over-dependence on a tourism economy and lost of natural habitat to development can degrade the quality of life for which the region became noteworthy. 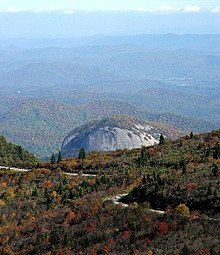 There are 82 mountain peaks between 5,000 and 6,000 feet (1,500-1,800 m) in elevation in western North Carolina, and 43 peaks rise to over 6,000 feet (1,800 m). Among the subranges of the Appalachian Mountains located in western North Carolina are the Great Smoky Mountains, Blue Ridge Mountains, South Mountains, Brushy Mountains, Sauratown Mountains, Great Balsam Mountains, Great Craggy Mountains, the Plott Balsams, and the Black Mountains. Mount Mitchell, in the Black Mountains, is, at 6,684 feet (2,037 m), the highest point in eastern North America. Valley and foothills locations typically range from 1,000–2,000 feet (300–610 m) AMSL. ^ "High Country Host - in North Carolina". High Country Host. Retrieved April 4, 2018. ^ Designs, AppNet. "Boone, Blowing Rock, Banner Elk, Beech Mountain, Western North Carolina Guide". www.highcountryinfo.com. Retrieved April 4, 2018. ^ "High Country Council of Government". Retrieved June 13, 2012. ^ "GNIS Detail - Mount Mitchell". geonames.usgs.gov. Retrieved April 4, 2018.